Android phones are now a part of almost every human life. For most of us, an Android phone is our constant companion, helping us keep in touch with friends and family, scheduling our daily calendar, contacting people and getting things done through its myriad apps and features. However, there have been instances wherein a person is locked out of the device, either because he has forgotten the unlock password or someone else has tampered with his phone. Instead of hard resetting your phone or taking to a nearby mobile dealer, help is at hand with Dr. Fone Android Unlock Screen Software; this software is specifically designed to assist you in such scenarios. With all-embracing features and functionalities, your smartphone has become an essential part of your business and personal life, and it is possible that you may accidentally lock the screen. Whether it is a new phone or a second-hand device, forgetting your Android mobile password is no crime and it happens often with many of us. It is also possible that someone else such as your children or sibling has locked the phone and now you can’t open it. You store not only your Contact numbers on it but also personal data such as photos and files. So if you or anyone else locks your phone accidentally, help is at hand and all you need to do is to visit their website and download the software to your Mac, PC or laptop, then follow the simple steps. How To Unlock Your Android? 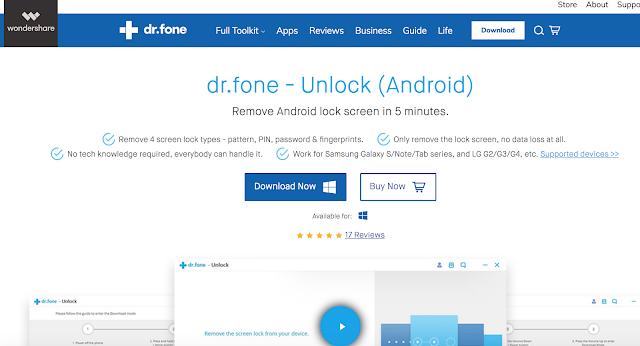 Dr. Fone is a simple tool that focuses on unlock features. Therefore the steps are not difficult. You can just connect your phone with USB cable and start the program unlock. This software offers extensive features such as the removal of four types of locks that includes fingerprint, PIN, password, and pattern lock; while working on this software you do not need any technical knowledge, and is compatible with almost every type of smartphone, and is affordable as well. One more feature that endears itself to the customer is the fact that this software quickly unlocks the software and only requires some steps without the loss of any database that has been saved by the user. Thus, you can confidently use the software without losing time or data. Unlocked mobile phones are very popular among smartphone users however when a phone has its screen locked it is a completely odious situation. When using a new software, the first concern of the user is always about the difficulty of operating and it always adds to some type of stress. But with this software, there is no need to worry. The operation is so simple that a child can also accomplish the job in minutes. This is because all you need to do is to connect your Android device to your computer and run the Android lock removal software. After that, you are just required to click once, and voila, your phone is open and you are ready to do your job, whether you want to read your emails or call someone. Now that you know using this software is easy as well as inexpensive, your next question might be whether the software can be used only on the Android devices of one brand, or any smartphone that is powered by Android. Dr. Fone software is presently compatible with Smartphones of LG and Samsung primarily, but in a short while, more and more brands will be added. Thus, whether you have purchased your device from LG or Samsung, you can use this software whenever you require it. A major issue with any new software remains the safety and security of the installed software as well as the risks that any connected device might run into. You don’t need to worry about corrupting your Smartphone's stored data and apps with this software, as it is completely read-only software. Due to this property, the software is unable to keep, modify or share your data available on your device with anyone or anywhere. As the creators of the software, Dr. Fone takes your concerns about your personal account or data seriously, hence have designed the software accordingly. After you unlock the phone, you would be the only person who would have accessed your Android device's data. A locked smartphone can be cause for panic, especially when there's an urgency to make a call or retrieve a file. Dr. Fone Unlock Screen Software is the Messiah which offers you peace of mind. When you have Dr. Fone Unlock Screen Software installed on your PC, Mac or laptop, you know there's no need to worry, help is close at hand.